Thoughtful, Last Minute, Holiday Hostess Gifts..
As the More is More Mom®, I’m all about……more thoughtful, last minute hostess gifts! It’s always a gift to be invited into someone’s home, but it is a particularly special treat this time of year when we’re all so busy. The best way to say thank you is with a small token of appreciation. It’s not necessary to give a great big extravagant gift. No, a thoughtful and meaningful gesture is much more appropriate and touching. Boys will be boys, with absolutely no sense of urgency or need to accurately communicate their plans. Saturday morning, my Nick announced that he had just gotten a text from one of his hockey teammates informing him that they decided to have an impromptu game film review at the home of one of the boys in the afternoon. Wow! There is nothing like having 17, incessantly hungry, teenage boys (and their darling girl goalie) descend upon you at the very last minute. One boy could eat you out of house and home, much less a Varsity Hockey Team! Had I only known, I would have whipped up a homemade tray of cookies or brownies. On such short notice, cookies from the grocery store bakery department would have to do. Besides, as quickly as boys inhale snacks, I’m not sure they fully appreciate treats made with tender loving care anyway. I made a quick trip to the grocery store for star shaped sugar cookies with red and green sprinkles. Last minute can still be festive! Next on my list was a fast Target run so I could pick up a little holiday platter. There is no reason to burden your hostess with the task of digging out a serving piece as she has guests descending upon her. You know my mantra is more of everything is always better, which includes festive, decorative ribbon. I have boxes of spools of ribbon for every conceivable occasion (I stock up at the worlds greatest stock up store; CostCo. They sell spool after spool of seasonal wire ribbon, which is amazing. The perfect ribbon is one of those small details that transforms your gift presentation from nice to spectacular. It even makes an ordinary item, like store bought cookies, a showpiece.). 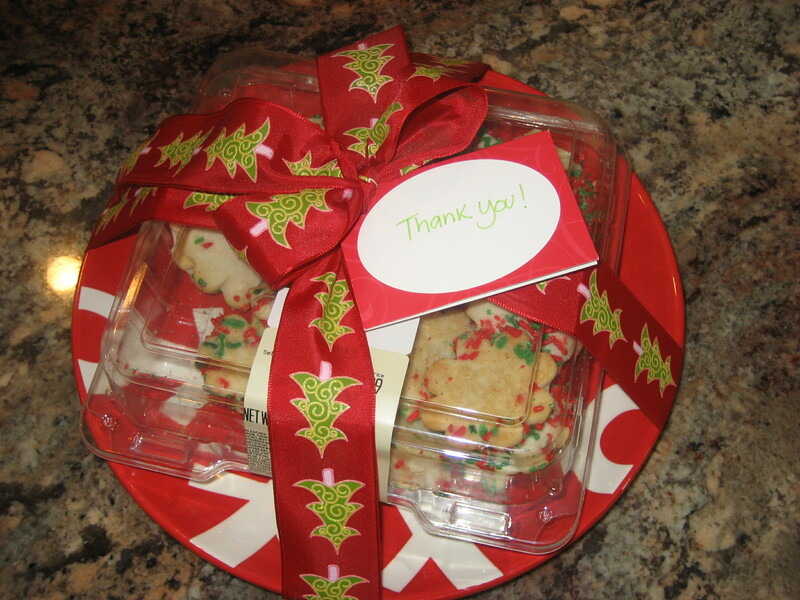 All wrapped together, the cookies and the platter, made for a lovely presentation. One Nick was completely embarrassed to bring into the game review get together. I knew I had done my job. 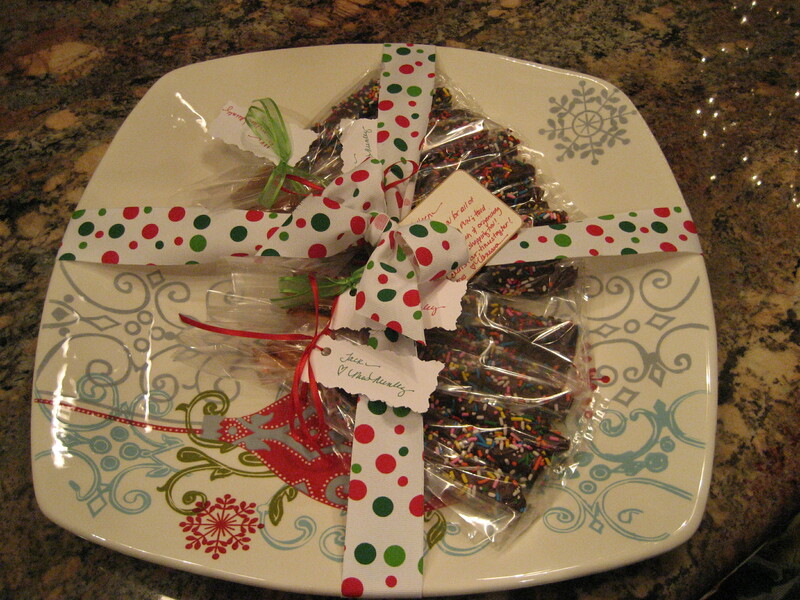 Another one of my favorite, quick and inexpensive, personalized hostess gifts is a serving piece, showcasing hand-dipped chocolate covered pretzels embellished with festive sprinkles. This is sooooo easy. All you need is a bag of pretzel rods, 2 bags of chocolate chips (I prefer milk chocolate) and decorative sprinkles. I stock pile clear, flat plastic gift bags, which can be found at craft stores, party supply stores like Party City, or even Target. They are perfect for individual servings of chocolate covered pretzels and are great for showcasing gift cards as gifts. For the gift card, stuff the bottom of the bag with either crinkly shredded paper filling, or small candies (like M n M’s or Hershey’s Kisses). Tie a ribbon around the bag at the top and you have a charming gift presentation. To make the pretzels, line a baking sheet or two with wax paper. In a deep microwave safe bowl, melt a bag of chocolate in the microwave for 1 ½-2 minutes. You’ll want to watch it so the chocolate is creamy and smooth, not over cooked and burnt. There is a very fine line. Stir until smooth. 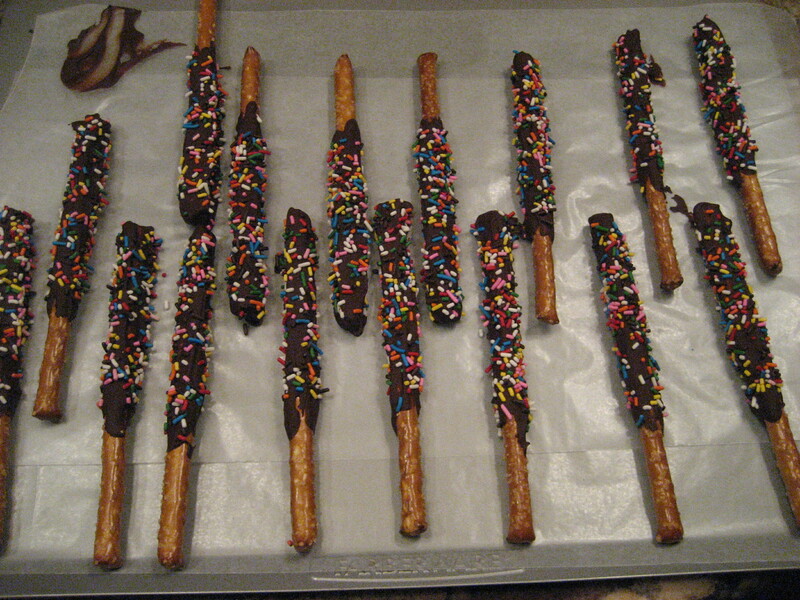 Dip a pretzel rod in the chocolate, using a spoon to drizzle the chocolate evenly over the rod. Over another bowl, shake sprinkles over the pretzel rod, turning until the rod is festive enough for your taste. Line the chocolate covered rods on the baking sheet, making sure they are not touching. Melt more chocolate as necessary. Put the baking sheet in the refrigerator until the chocolate sets. 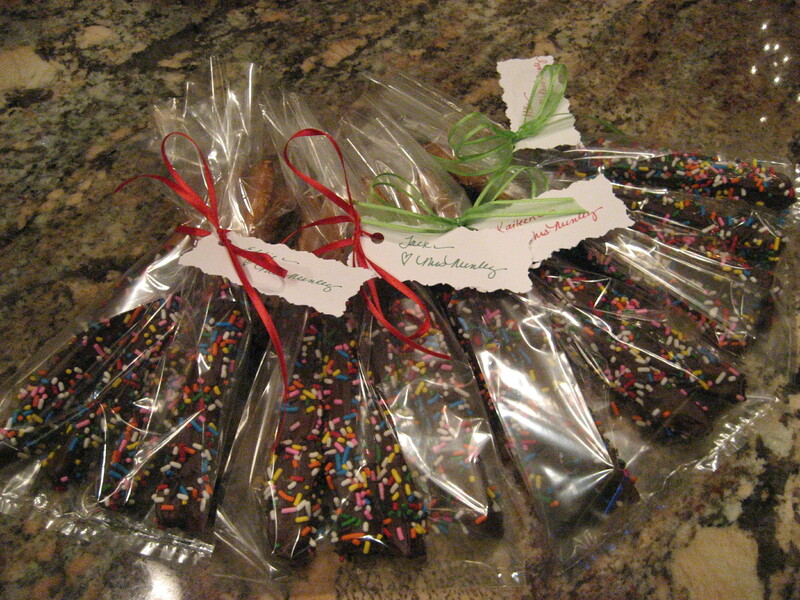 I like to make up a gift bag of chocolate covered pretzels for each individual child in the home. College students totally count. Anywhere between 4-6 pretzel rods make for a nice treat. I tie each bag off with a gift card and a ribbon for each child. Using double-sided tape, I secure the bag to a serving piece that I have selected for my hostess. The tape prevents the bags from sliding around all over the place, and makes for a much more orderly and neat presentation. I then wrap the whole platter with ribbon from my treasure trove of decorative ribbon, making a gorgeous and sumptuous presentation. Always a sucker for photographs of family and friends, I think that picture frames make a delightful gift. You’ll never go wrong with a classic and elegant silver frame. If you don’t have a picture to accompany the frame, insert a note of thanks behind the glass until you do. How easy is it to format the page size of a Word Document to the same size as the photo intended for the frame and type in a message expressing your appreciation for your host’s hospitality? Coordinate the ink to the ribbon you’ll be using to wrap it up and you’ll have a beautiful gift. To sweeten the deal, if you have an opportunity to snap a photo at the get together, print one to size and send it with a thank you note after the party is over. It will serve as a fond reminder of a great celebration. For friends that can’t possibly pack one more thing into their home, a CD is a great gift. Classic Christmas tunes or recording from a favorite performer or movie soundtrack is a thoughtful and personal gift. 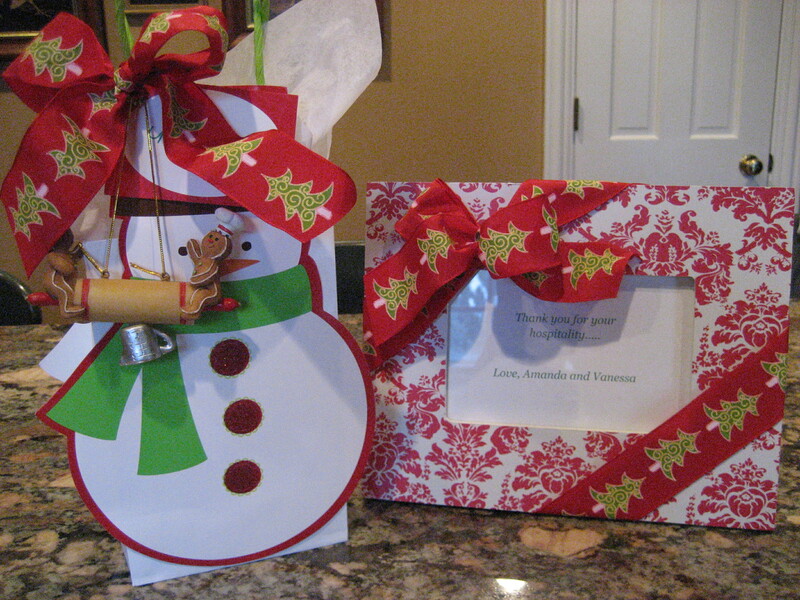 Slide the CD into a small gift bag, tying an ornament to the handle with pretty ribbon and note. The ornament could relate to the music, the particular event, or the interests of your hosts. More thoughtful gifts, more entertaining, more celebrations…..
More is More Mom · More of Everything is Always Better!